Notre Dame Physics Graduate Student Rodolfo Capdevilla has been awarded a 2016 Ganey Community-Based Research Graduate Stipend. The project “Inspiring High School Students to Enter STEM Careers Using Quantum Physics Demos” is the product of Capdevilla’s training at the “Social Responsibilities of Researchers Program” (SRR) with the Reilly Center. 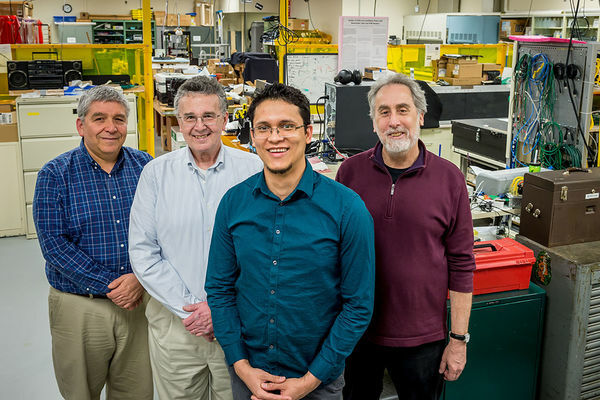 SRR is a NSF-funded program which aims “to equip and motivate emerging scientists and engineers to be cognizant of the connections their research has with society.” Capdevilla was mentored at the SSR program by Prof. Don Howard of the Philosophy Department. STEM engagement and education has been defined as a critical national need. In Indiana, only 27% of the degrees obtained are STEM-related, and less than four percent of the workforce is involved in STEM fields in a technology-driven economy. Quantum physics is a modern paradigm upon which all new physics research relies. It has impacted our lives with many technological applications, including lasers, MRI scanning, and LED devices. STEM education can create a scientifically literate populations and quantum physics can be an entry for training students for the STEM workforce, as well as to be leaders and innovators in STEM fields. When Capdevilla decided to apply for the Ganey Graduate Student Stipend he spoke with Prof. Mitch Wayne about the QuarkNet program and his many years of experience with outreach. Prof. Wayne offered that QuarkNet could partner with him in the project, and if this is successful it might be possible to apply for other grant funding. This project represents the collaboration of high school physics teachers from South Bend who participate in QuarkNet, national QuarkNet staff, and Notre Dame professors and students. Funded by the National Science Foundation and the U.S. Department of Energy, QuarkNet is a collaboration between physics teachers and physicists to bring particle physics to high school classrooms. Capdevilla has already begun to meet with the QuarkNet teachers. The purpose of this research is to design and test demonstrations in quantum physics embedded in career orientation seminars in order to increase STEM engagement in local high schools. The demonstrations central to this project are more than pedagogical models; they are career orientation seminars. In addition, the team will present less complex demonstrations to parents simultaneously to increase STEM awareness. The initial focus of this project is John Adams High School in South Bend, La Lumiere High School in La Porte, and Trinity School at Greenlawn (South Bend). The partnership with QuarkNet, however, will help to disseminate this research. Seminars could be replicated at other high schools nationally or even internationally. Originally published by Shelly Goethals at physics.nd.edu on April 21, 2016.